THE bonhomous speeches of welcome were hardly over when sparks began to fly at the fourth conference of parties (cop-4) to the climate change convention, which met in Buenos Aires, Argentina, in the first half of November. Delegates from developing countries bristled when the president of the conference, the Argentine secretary of natural resources and sustainable development, Maria Julia Alsogaray, suggested the inclusion of commitments from developing countries in the conference agenda. A Chinese delegate saw any discussion on the subject as a means of destroying G-77 unity, while a Brazilian negotiator said it was a means of helping some countries avoid existing commitments rather than promoting the climate convention. The convention calls only for industrialised countries to reduce carbon emissions that contribute significantly to global warming. But some developed countries are unwilling to make emissions cuts unless developing countries make commitments and help them in meeting their's through emissions trading mechanisms. According to the Kyoto Protocol, negotiated at the third conference of parties (cop-3) last year, emissions targets set for each country have to be met over a period of five years. European Union (Eu) countries had to reduce emission levels by 8 per cent from the 1990 level, the us by 7 per cent, and Japan by 6 per cent. The six major green- house gases (GHG) are carbon dioxide, methane and nitrous oxide as well as three synthetic substitutes for ozone-depleting chloroflourocarbons. The ghost of voluntary commitments has haunted climate negotiations since 1997,when us senators signed the Byrd-Hagel Resolution which stating that the Senate would not ratify any treaty to reduce emissions until there was 'meaningful participation from key developing countries were responding to the blatant pressure from us business groups who have worked methodically to convince us citizens that signing a climate treaty without participation from developing countries would result in massive price rise and put us interests at an economic disadvantage. Since then, the us government has Tried constantly to get developing countries to commit to voluntary reductions, even though this will compromise development activities in countries of the South. In terms of negotiations, this was a step back from the from Republican senators present at the copprinciple of 'common but differentiated 4 for signing the protocol, a move that was responsibilities' that was agreed to as the attributed by some to the Lewinsky factor.basis of the climate treaty, in view of the fact Though the announcement was followed that industrialised countries were responsiimmediately by a detailed explanation on ble for historical emissions in the atmos how'signing' the protocol was very different phere, and hence would make reductions from 'ratifying' it, senators were not first, while allowing developing countries impressed. space to grow. "Signing now implies a commitment to The Byrd-Hagel resolution has hung like the Protocol that may undermine our future Damocles' sword over the climate negotialeverage with the biggest emitters in the tions in Buenos Aires. us ratification is essendeveloping world," said Robert Byrd, one of tial, as the us is responsible for a fourth of the the senators responsible for the Byrd-Hagel world's carbon emissions. So instead ofjudgResolution. Chuck Hagel dared the president ing a mitigation activity from the point of The US government to present the treaty for ratification to view of its benefits to the climate problem, the Senate. "If this treaty is good enough the current yardstick for proposals at climate has tried constantly to to sign, it is good enough to be submitted meetings seems to be the US's acceptability. Even as it held the world hostage and get developing Hagel taunted. showed little initiative in cutting domestic carbon emissions, the us diplomacy has been countries to commit to Trading Emission Credits at work looking for possible chinks in the Top on the us agenda at cop-4, besides G-77 armour. It has found many. Argentina voluntary commitments, was the Clean recently agreed to voluntary commitments, voluntary reductions, Development Mechanism (CDM). The us providing the us with a role model to praise industry is pushing for trading as the only and uphold. Argentine president Carlos even though this way the country can meet its commitments Menem's announcement was met with exulas they are unwilling to make domestic cuts, tation by the us undersecretary of state for would compromise or even to accept a cap on the amount of economic, business and agricultural affairs, reductions they can make through trading. Stuart Eizenstat. He lost no oppurtunity to development activities Through this international emissions trading praise the decision, uphold it as a 'first', and mechanism, industrialised countries or comexpress his hope that other developing counin the South panies can purchase credits by implementing tries would follow. Many countries among the G-77 realised countries. that the us was going overboard by linking Once again, the us found the chink they every other aspect of the negotiations to voluntary commitments from developing countries, and exploited it to the hilt. African tries. "They even link the review of the adenations were unhappy with the initial quacy of their own commitments under the emissions trading pilot projects (the Kyoto Protocol to voluntary commitments 'Activities Implemented jointly' or AIJ proby saying that for us to meet our commitments, you have to take on commitments," said Paul Maclons, a South African negotiator. Bikenibeu Paeniu, the prime minister of Tuvalu, one of the small island states of the Pacific which are likely to be the worst affected by climate change, was strong in his reprimand to the emphasis being laid on voluntary commitments. "During this conference we have witnessed an attempt by some Annex I countries (developed countries) to off-load their responsibilities onto the developing countries. Some developing countries may be enticed by short-term gains. But this is not the answer. Planting trees is not going to stop global warming," Paeniu said. US president Bill Clinton came under fire emission credits.---- gates adopted a so-called Plan of Action. 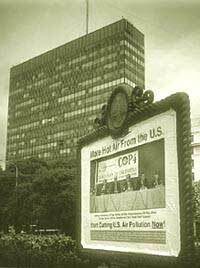 High on the Buenos Aires agenda was the need to flesh out the mechanisms of the Kyoto Protocol. These mechanisms were designed with the purpose of assisting developed countries to reduce the costs of reaching their combined 5.2 per cent emissions reduction targets by the five-year first budget period of 2008-2012 set by the protocol. A review of the adequacy of industrialised countries' commitments to reduce carbon emissions for the second time was supposed to be one of the main activities of the conference of parties. The first review was carried out in Bonn, in 1995. Some industrialised countries resorted to verbal gymnastics and tried to include "all parties" (including developing countries) in a clause that could only extend to them, as developing countries have no reduction commitments -to review. Developing countries hit back, sternly warning industrialised countries not to sidetrack the main issue: developed countries have to reduce emissions. About the only decision the present cop came to taking was that the commitments were, in fact, inadequate. Beyond that, the developing countries accused the developed countries of non-performance, while the industrialised countries accused the developing of non-participation, and an attempt to use the discussion to maximise benefits from technology transfer and financial mechanisms. Rather than cut emissions at home by reducing fossil fuel use, industrialised countries would rather meet their commitments under the Kyoto Protocol by 'trading' emissions credits with developing countries. In return for technology which will reduce emissions in developing countries, the industrialised nations will be able to continue along their current energy path. Three trading mechanisms are currently under discussion: joint implementation (ii, countries joining up to control emissions), emissions trading, and the Clean Development Mechanism (CDM, companies in the developed world can enter into cooperative projects to reduce emissions). Though their only purpose is to assist developed countries in meeting their commitments, they have been dressed in many frills to make them attractive to developing countries. Developed countries are eager to implement the mechanisms, but G-77 and China The only decision the COP came to taking was that commitments were inadequate. Beyond that the South accused the North of non-performance. The North only wanted to maximise benefits from flexible mechanisms held back their horses, by demanding, first, a definition of the basis for trading. Though there is a clear split in the G-77 position, with some countries keen to have CDM started as soon as possible, they have maintained that unless they have 'entitlements' to define how much they can emit, they would not know how much they can sell. One question was whether developed countries should be allowed to meet their entire commitments through trading, or whether there should be some restrictions (or caps) to ensure that at least part of the commitments are met through domestic changes. While the European Union supported the G-77 stand that trading should be Isupplementary' to domestic action, Canada, Australia, the us, Norway and Japan, among others, wanted to be able to meet their entire commitment through trading. There was little progress on these issues, but the final decision, while prioritising the CDM, adopted a work programme on mechanisms. The programme included a long shopping list which is to be discussed further. Developing countries asked for a 'technology transfer mechanism' which would assist them in getting environmentally-sound technologies and know-how on non-commercial and preferential terms. This was'not acceptable to the us. Developing countries stress that transfer of technology should not be related to the trading mechanisms, while developed tried to stress the potential for transfer through the quick implementation Of CDM. The cop decided to establish a consultative process, consisting of regional workshops and meetings to sort out the matter further. The financial mechanism of the climate change convention came up for review at cop-4. The Global Environmental Facility (GEF) has been the financial mechanism for the convention so far and developed countries were keen to make it the permanent mechanism. Developing countries were willing to accept it only if it adhered to the principles of the convention. It was finally agreed that a restructured GEF would serve as the financial mechanism, and provide new and additional funds for addressing climate change and adaptation measures.